The Spanish Civil War drew some three thousand volunteers from the international leftist community to join the democratically elected Spanish government in its fight against the fascist troops of Francisco Franco, a struggle that proved ultimately unsuccessful and set the stage for World War II. 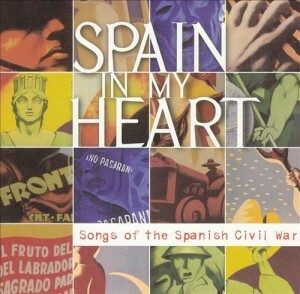 Many of the songs composed and sung on those Spanish frontlines became popular during the early years of the folk revival nearly 30 years later and are presented in this collection in newly recorded versions, along with original material inspired by the short-lived Spanish Republic. The venerable Pete Seeger opens the album with a spoken piece and lends his banjo skills to Arlo Guthrie’s take on “Jarama Valley” (which is set to the tune of the American chestnut “Red River Valley”). Aiofe Clancy, daughter of the late Bobby Clancy of the Clancy Brothers, sings “The Bantry Girls’ Lament,” a song she remembers her father singing, and joins Shay Black on Christy Moore’s “Viva la Quinte Brigada.” The Fifteenth Brigade is also remembered in a second — but different — song with the same title, performed by the group Quetzal. John McCutcheon’s original “The Abraham Lincoln Brigade” and a version of “Peat Bog Soldiers” by Laurie Lewis are highlights. As with all Appleseed recordings, the liner notes are extensive.